The Flyer has an overall height of 165 metres (541 ft) and was the world's tallest Ferris wheel until the 167.6 m (550 ft) High Roller, which is 2.6 m (9 ft) taller than the Flyer, opened on the Las Vegas Strip in Nevada, US, on 31 March 2014. The previous record holder, the Star of Nanchang, in Jiangxi, China, is 160 m (525 ft) tall, although its 153 m (502 ft) diameter wheel is larger than the Flyer's 150 m (492 ft) wheel. The Singapore Flyer was first conceived in the early 2000s by Patrick MacMahon of Melchers Project Management, a subsidiary of German company Melchers. Formal planning commenced in 2002. A new company, Singapore Flyer Pte Ltd, was formed as the developer, with Melchers Project Management holding a 75% stake, and the remainder held by Orient & Pacific Management. The project was formally announced and endorsed on 27 June 2003 by the Singapore Tourism Board with the signing of a memorandum of understanding, formalising the understanding between the developer and tourism board with regard to the land-acquisition process. Under this agreement, the tourism board was to purchase the plot of land in Marina Centre from the Singapore Land Authority, and lease it to Singapore Flyer Pte Ltd for 30 years with an option to extend the lease by another 15 years. The land was to be rent-free during the construction phase of the project. In July 2003, Jones Lang LaSalle was appointed as the real estate advisor. Takenaka and Mitsubishi were selected as the main contractors, and Arup as the structural engineer. Early designs showed a 169 m (554 ft) tall wheel similar to the London Eye, drawing criticism that it lacked originality. The developers pointed out that the design was not finalised and was merely for conceptualisation purposes, though the final project changed little from the early designs. Subsequently, the project was to grind almost to a halt when the developer faced difficulties in sourcing funds to build the wheel. Original plans to complete the wheel by the end of 2005 were thus postponed indefinitely, and there were reports (denied by the Singapore Tourism Board) that the tourism board has set an ultimatum date of 31 March 2005 for the developer to iron out its financial issues and to keep the development going. By September 2005, the project was revived when funds were successfully sourced from two German banks. Collin William Page, a subsidiary of ABN AMRO, was to provide equity to a maximum of S$100 million, with a further S$140 million coming from HypoVereinsbank. With this injection of S$240 million, the largest single foreign investment in the Singaporean entertainment industry, construction was slated to begin by the end of the month. The stakeholders then were AAA Equity Holdings, Melchers Project Management, and Orient & Pacific Management. In August 2007, Florian Bollen, Singapore Flyer Pte Ltd chairman, raised his stake in the Singapore Flyer from 60% to 90% through acquisition of Melchers Project Management's 30% stake. The deal was done via AAA Equity Holdings, a private investment vehicle headed by Bollen. Orient & Pacific Management, which spearheaded the project development management, owns the remaining 10%. The development has a gross building area of approximately 16,000 m2 (172,000 sq ft), built on a 33,700 m2 (362,700 sq ft) site along the Marina Promenade. Designed by Arup and Mitsubishi Heavy Industries with a capacity of up to 7.3 million passengers a year, the normally constant rotation of the wheel means that a complete trip lasts approximately 32 minutes. The Flyer's 28 air-conditioned capsules are mounted outboard of the rim of the wheel structure, providing continuously unobstructed views. Each capsule has a floor area of 26 m2 (280 sq ft) and is capable of holding 28 passengers, or up to five wheelchairs and 15 other visitors when booked in advance for use by disabled guests. The wheel initially rotated in a counter-clockwise direction when viewed from Marina Centre, but on 4 August 2008 this was reversed on the advice of Feng shui masters. Wheelchair ramps and lifts, handicapped toilets, and a dedicated parking lot for the disabled are also provided. The groundbreaking ceremony was held on 27 September 2005, with Mah Bow Tan, Minister for National Development, as guest of honour. The spindle was fitted on 13 December 2006, and the outer rim was completed on 9 April 2007. Installation of the passenger capsules began on 3 August 2007and was completed on 2 October 2007. The Flyer opened in 2008. During Chinese New Year, corporate 'inaugural flights' were held from 11 to 13 February, tickets for which sold out for S$8,888 (US$6,271), an auspicious number in Chinese culture. The first public rides were on Valentine's Day, 14 February, the soft launch on 1 March, and the official opening on 15 April, at which prime minister Lee Hsien Loong was guest of honour. In July 2008, the Flyer was stopped because of a minor fault in the braking system. On 4 December 2008, the wheel was stuck for nearly five hours due to bad weather and some 70 people were stranded. On 23 December 2008, the wheel stopped and trapped 173 passengers for about six hours. The breakdown was caused by a short circuit and fire in the Flyer's wheel control room, which cut off the air-conditioning in the wheel. Eleven passengers were evacuated via a sling-like device from a few of the capsules, and those stranded were given food and drink. The wheel restarted nearly seven hours after it had stopped and two people were hospitalized. The Flyer was closed indefinitely and an investigation into the cause of the malfunction was launched. The wheel re-opened on 26 January 2009 after the Singapore Police received the final safety certification report from the Conformity Assessment Board. Following this breakdown, additional back-up systems costing about $3 million were installed. These included a generator, winches, three anti-fire and smoke systems, and heat detection devices. On 18 July 2010, the ride was shut after one of its electrical cables supplying power to the air-conditioning systems was struck by lightning, affecting the air-conditioning system. Some 200 passengers had to be evacuated. The Flyer re-opened on 20 July 2010 after repair work was completed. On 20 June 2013, operations were temporarily suspended to protect employees from record-high pollution levels in Singapore, the first time the Flyer had shut due to haze. On 25 January 2018, operations were suspended due to a technical issue. All 61 passengers on board were brought to ground safely when the incident occurred at about 9 am. Operations resumed two months later on 1 April. In March 2010, Great Wheel Corporation, a consultant for the Singapore Flyer, was one of several companies named in a report alleging embezzlement, lodged with the prosecutor's office in Berlin, Germany. Transfers of €3 million to companies in the Virgin Islands and UK, and monthly payments of €40,000 from the Berlin wheel's project company, Great Berlin Wheel, to its linked company Great Wheel in Singapore, are questioned. A prosecutor's office spokesperson said: "We understand there were false contracts concerning non-existing deals, and these contracts were made to take the money for private concerns." Florian Bollen is chairman of both Great Wheel Corporation, registered in Singapore as GWC Holdings, and Singapore Flyer Pte Ltd. A spokesperson for the Singapore Flyer said: "The giant observation wheel in Berlin is separate from the Singapore Flyer and it is separately owned and operated. Great Wheel Corporation is also a separate entity from the Singapore Flyer. Any investigations relating to the Berlin wheel and Great Wheel Corporation have no effect on and no relationship with the Singapore Flyer's operations and finances." On 28 May 2013, the Singapore Flyer announced that it was in receivership. Accounting firm Ferrier Hodgson has been appointed as the receiver and manager of the company's charged assets. Ferrier Hodgson said it is looking into identifying investors to manage and enhance the Singapore Flyer, and will ensure smooth operations at the Flyer throughout the receivership. On 28 August 2014, Straco Leisure Pte. Ltd. announced the acquisition of Singapore Flyer. Straco Leisure Pte. Ltd. is 90% owned by Straco Corporation Limited, a Singapore listed company that operates tourist attractions in China such as the Shanghai Ocean Aquarium and Underwater World Xiamen. The remaining 10% is owned by WTS Leisure Pte. Ltd., one of the largest private tour bus operators in Singapore. The Bloomberg Television series High Flyers is filmed in one of the Flyer's capsules. The Flyer makes an appearance in the 2018 film, Crazy Rich Asians, based on the novel of the same name by Kevin Kwan. ^ a b c d e "History & Milestones". Singapore Flyer. Archived from the original on 24 March 2013. Retrieved 8 February 2013. ^ a b "Singapore Flyer opens to the public from Saturday". Channel NewsAsia. 1 March 2008. Archived from the original on 3 March 2008. Retrieved 2 March 2008. ^ a b "Development and Operations of Large Scale Visitor Attractions". Melchers Project Management. Archived from the original on 18 April 2013. ^ a b "Straco Leisure Pte Ltd signs agreement to purchase the Singapore Flyer". Singapore Tourism Board. 28 August 2014. Archived from the original on 10 September 2014. Retrieved 10 September 2014. ^ "S'pore flyer set to spin on Monday night". Archived from the original on 28 October 2017. Retrieved 16 October 2018. ^ "5 things about Singapore Flyer and new owner Straco". Archived from the original on 26 March 2018. Retrieved 16 October 2018. ^ Press, Associated (11 September 2013). "High Roller: world's largest Ferris wheel hoisted into place in Las Vegas". Archived from the original on 15 September 2018. Retrieved 3 April 2018 – via www.telegraph.co.uk. ^ Santorelli, Tom. "'World's tallest' Ferris wheel opens in Las Vegas". BBC. Archived from the original on 2 April 2014. Retrieved 2 April 2014. ^ "Fun Facts about the Flyer". Singapore Flyer. Archived from the original on 24 March 2013. Retrieved 28 May 2013. ^ "English Brochure" (PDF). Singapore Flyer. Archived from the original (PDF) on 8 October 2013. ^ "Design Concepts". Singapore Flyer. Archived from the original on 24 March 2013. Retrieved 28 May 2013. ^ "Feng Shui turns this wheel". The Straits Times. Archived from the original on 4 August 2010. Retrieved 14 September 2010. ^ "Wheelchair Access - Singapore Flyer". Singaporeflyer.com. 16 December 2007. Archived from the original on 9 September 2010. Retrieved 14 September 2010. ^ "PM Lee officially opens Singapore Flyer". Channel NewsAsia. 15 April 2008. Archived from the original on 20 April 2008. Retrieved 16 April 2008. ^ a b c "Channel NewsAsia - Singapore Flyer to remain closed pending investigations". Channel NewsAsia. 23 December 2008. Archived from the original on 24 September 2010. Retrieved 14 September 2010. ^ "Dozens trapped on Singapore wheel". BBC News. 23 December 2008. Archived from the original on 26 December 2008. Retrieved 28 December 2008. ^ "Channel NewsAsia - Singapore Flyer resumes operation after month-long shutdown". Channel NewsAsia. 26 January 2009. Archived from the original on 4 June 2011. Retrieved 14 September 2010. ^ "New back-up systems being installed at Singapore Flyer". Channel NewsAsia. 22 January 2009. Archived from the original on 23 January 2009. Retrieved 23 January 2009. ^ "S'pore Flyer resumes operations after 2-day closure due to air-con glitch". Channel NewsAsia. 20 July 2010. Archived from the original on 23 July 2010. Retrieved 20 July 2010. ^ "Haze update: Singapore Flyer to close temporarily due to haze". The Straits Times. 20 June 2013. Archived from the original on 21 June 2013. Retrieved 24 June 2013. ^ "Singapore Flyer suspends operations due to 'technical issue', will remain closed on Friday". The Straits Times. 25 January 2018. Archived from the original on 26 January 2018. Retrieved 26 January 2018. ^ "Singapore Flyer operating again after receiving go-ahead". The Straits Times. 1 April 2018. Archived from the original on 1 April 2018. Retrieved 1 April 2018. ^ "Singapore Flyer in receivership". Archived from the original on 7 June 2013. Retrieved 28 May 2013. ^ Tan, Weizhen (8 May 2014). "Singapore Flyer's woes takes a new spin after Merlin talks collapse - TODAYonline". TODAY. Archived from the original on 9 August 2014. Retrieved 7 August 2014. ^ "High Flyers for Bloomberg". 14 March 2014. Archived from the original on 4 March 2016. Retrieved 6 August 2015. 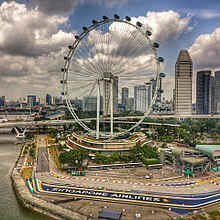 Wikimedia Commons has media related to Singapore Flyer.